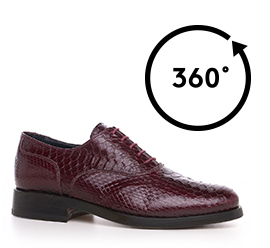 Handmade elevator Oxford shoes with upper in soft burgundy python leather that is characterized by the natural brightness of its scales. The real leather channel stitched sole ensures maximum comfort and greater durability. A stylish shoe with an invisible elevator system up to 3.1 inches (8 cm) meticolously detailed, ideal to give a distinctive and exclusive touch to your look. The GM master craftsmen can customize the shoe according to any specific request.